The program is designed to meet the needs of learners requiring a qualification enabling the application for a licence for security guarding in accordance with the Regulation respecting the training required to obtain an agent licence to carry on private security activities in Quebec. The course addresses in detail the meaning and content of private security and provides students with the interpersonal and professional skills required for a career as a security guard. The course aims at leading the students to acquire theoretical knowledge and technical training required to work as security professionals, and to develop the basic skills prior to being deployed on job sites as security agents. Upon successful completion of the 80 hours course, the student is awarded a training certificate in private security guarding. For information, course schedule and to register Contact Us. The running of any course is subject to sufficient number of registrations for that course. It is recommended that registration and payment be received at least 5 business days prior to the start date of the course to secure a seat. 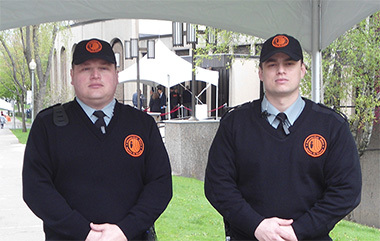 Montreal Elite Security is responsible for certification only. Licensing inquiries must be directed to the Bureau de la Sécurité Privée.